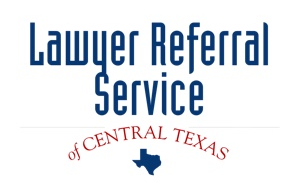 Lawyer Referral Service of Central Texas, Inc. is a nonprofit service established in 1966. LRS has more than 250 lawyers with 10 years of experience practicing in over 50 areas of law. Our referral counselors help you find an appropriate attorney for your concerns. We meet the standards of the American Bar Association Standards for Lawyer Referral. Our lawyers are insured and in good standing with the State Bar of Texas. We have expertise in handling cases related to administrative, bankruptcy, business law, civil appeals, criminal law, employment law and family law.